On Guard is dōTERRA®'s unique, proprietary blend formulated to support healthy immune function. Wild orange essential oil, combined with clove, cinnamon, eucalyptus and rosemary offer a fragrant, natural and effective alternative to synthetic options for immune support. On Guard, with its unique aroma, is one of our most versatile blends. It is also safe to use on counter tops, as a non-toxic way to cleanse surfaces, or to purify the atmosphere by diffusing. 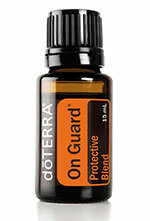 On Guard is superb for eliminating and controlling pathogens due to the potency of its constituents. For aromatic, topical, or dietary use.